Every once in a while something happens in the hobby that knocks you off your feet and makes you say, "What the f**k?" I find myself asking that question more frequently than I used to; the hobby has moved further along over the years, and we're seeing some pretty obscure stuff being produced. It's not just the models, mind you. For example, a few years ago one of the aftermarket companies released a set of dry transfer decals for paint chips. Really? Are there modelers so lazy that they can't dip a paintbrush into some silver paint and dab it on the model? Really? But it's the models that get our attention, right? I guess we're going to have to get used to seeing weird stuff like Meng's 1/35 Tortoise and Special Hobby's upcoming 1/72 Gloster Meteor F.Mk.8 Prone now that the manufacturers have released kits of nearly every variant and subvariant of the Pzkpfw IV and P-51. That's not a not bad thing, but I predict that surprise is going to become the de rigueur standard in our hobby for 2013 and every year thereafter. There will always be a group of modelers who appreciate every new model no matter how obscure, and the rest of us will remain, at best, intrigued; we might purchase one of these oddball subjects for shits and grins. What will truly surprise us will always be the completely bizarre choices, and this year that award must go to Academy for their decision to mold their beautiful new 1/48 F-4B Phantom II in two colors. Really? Yes, it's true. It would seem that the design and management team from 1975 Matchbox have come out of retirement and are now gainfully employed at Academy. 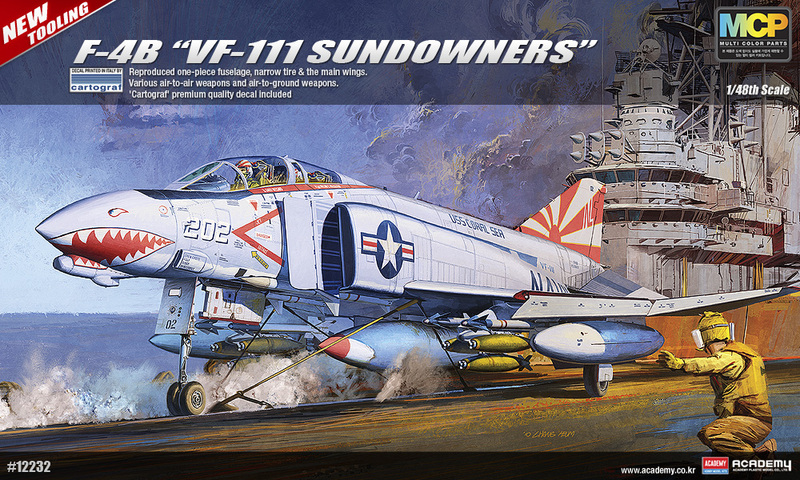 The Phantom is molded in white and light grey, presumably to make it easier for the beginner modeler to create a reasonable representation of the aircraft without paint. Wasn't that the intent behind the two-color Matchbox kits? In fairness, that's a good idea, but how many beginners are buying a $69 kit at their local hobby shop for their first foray into plastic modeling? Now I'm going to log onto my favorite online retailer to order three. Nice post! Can you tell me, which is your favourite online retailer?